Karnataka State Police Department (KSP) given the KSP Civil Police SI Answer Keys of 13th Jan 2019 exam. 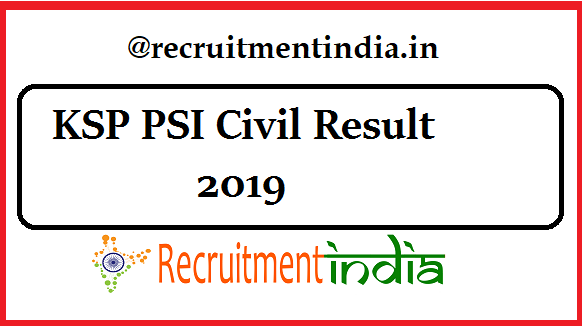 In March 2019, the KSP PSI Civil Result 2019 will [email protected] Observing the exam paper level, the department fixes the KSP Police SI Civil Cut Off. Candidates, soon we will post the expected cut off range so you can know your score is enough to get the chance in the KSP Civil PSI Merit List. This cut off will available when the scores are revealed. KSP PSI Viva Voice Eligible List OUT!!! Latest Update (05th March 2019): KSP PSI Viva Voice Eligible List is released so candidates can download the links are provided below. Check now. Karnataka State Police Department for appointing the 190 Police Sub Inspector (Civil) vacancy organized the 2nd recruitment round that is written the exam on 13th Jan 2019. Next alert from KSP board is KSP Civil Police SI Answer Keys of 13th Jan 2019 held exam is given in its main portal. Releasing the answer key implies that the recruitment board is starting the response sheet verification of the exam holders. As early as possible the KSP wishes to end up the correction process in order to declare the KSP PSI Civil Result 2019. For notifying the frequently ongoing updates in the KSP portal particularly related to the Karnataka Police SI Result 2019, recruitmentindia.in posting this page. Applicants, who are the participants of the KSP Civil Police SI Examination 2018-19 tune to this page. Karnataka State Police Department presented a separate link to check the KSP PSI Civil Result 2019 so that the one who is waiting for these result don’t need to struggle for catching up their scores. With the admit card number, very quickly in just seconds the display of Karnataka State Police SI Civil Result is possible for the applicants if they have entered our page. Supporting link of KSP Civil PSI Exam Scores furnished now. The link status now is in the inactivated state. It will turn into the active state during the time of KSP board officially announces the exam outcome of all the postulants. New link for the result is going to be delivered @psi18.ksp-online.in. KSP 190 Police Sub Inspector(Civil) Posts written examination is completed on 13th Jan 2019. In th gap of 10 days that is on 24th Jan 2019, the provisional KSP Police Civil SI Answer Keys are given ou. Objection format against any kind of false option can be submitted by the exam holders. So because of this feasibility, the officials only directly said the official format of objection form of KSP PSI Civil Answer Keys. The present shown key is the provisional one and again after considering the response from the candidates, it will release the final Karnataka Civil Police SI Answer Keys that cannot undergo any kind of changes after the release. For the 190 Vacancy, hundreds of competitors are participated. Hence to screen out the maximum number of candidates in the written exam round only KSP will consider the KSP Police Civil SI Cut Off Marks. After the tally of the written exam marks of each and every contenders according to the category of the applicants, this least scores to qualify is decided. Postulants have no option of giving an objections in the matter of KSP Civil PSI Merit List which is delivered on the basis of the cut off. KSP Civil PSI Cut off can be very high if the exam paper is easy. If a large number of the competitors have secured good marks in the exam, then KSP dept will increase the cut off compared to the previous year. After KSP PSI Civil Result 2019 checking, wait for the certificates verification dates. bro is this result of the candidates who wrote exam on 13/01/2019?? Sir can you say ex service man cast wise cutt off marit list pl?.